Barton G (Miami) is hands down one of my favorite restaurants I’ve been to in the United States. 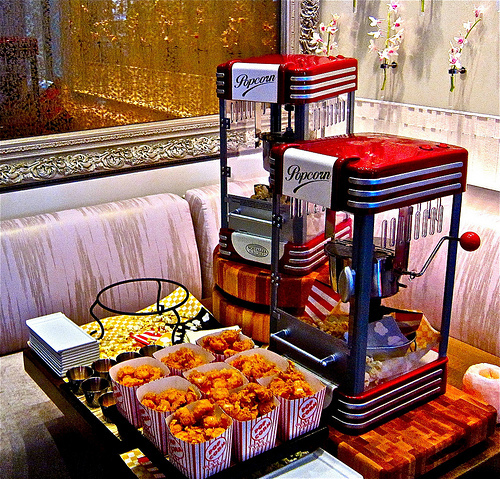 The unique blend of high end, fun and creative dishes coupled with exceptional service is the perfect combination that makes this eatery so special. Located at 1427 West Ave, Miami Beach, FL 33139 on South Beach, Barton G is a direct reflection of its owner/creator Barton G. Weiss, a well-respected events concept designer and restauranteur. Weiss’ unique and uncanny talent for constructing some of the most elaborate events for the likes of Fortune 100 and 500 companies, professional sports organizations and celebs themselves, have gained him solid space in the world of event planning/restaurant creating. For over 10 years now Barton G has been a staple in Miami’s South Beach restaurant scene and has no signs of letting up anytime soon. My first dining experience here was 4 years ago with my wife with a very anxious return recently in July of this year. From walking through the door all the way thru dessert service our second time around at Barton G was just as amazing as our first time. Our initial greeting from the hostess was very warm and welcoming even with the restaurant being busy. Our server was very informative and patient not pressuring us to order right away recommending some dining favorites and allowing us to decide for ourselves on what to order. Barton G’s menu isn’t extensive, but very creative and well thought out. 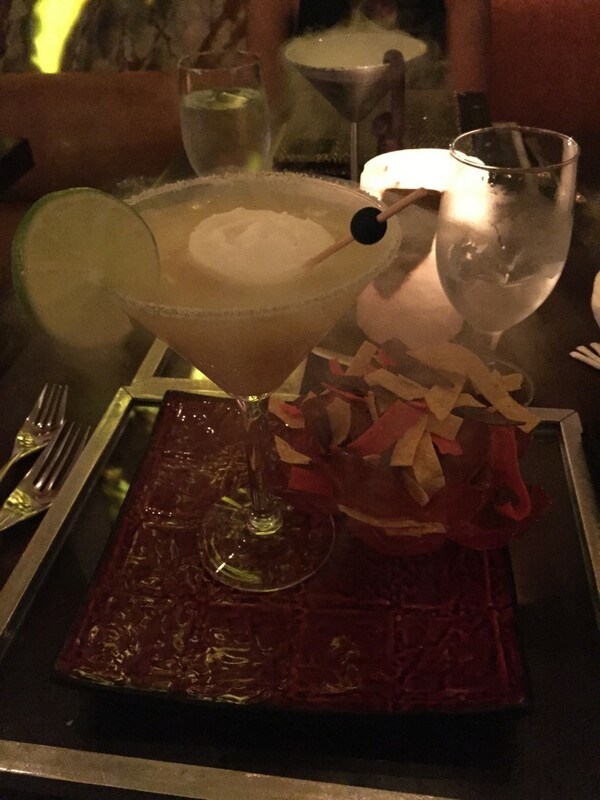 Starting with the cocktail menu, this list offers some tempting choices solely by the signature drink names. Me being a sucker for a GREAT margarita I ordered the Cooper’s Margarita ($27), a top shelf cocktail complete with nitrous and a side of tortilla chips for a fun presentation. My wife and I have pretty much the same pallet when it comes to food which is always great when you dine out. It allows us to sample multiple menu items to try to get a feel for as much of the menu as possible. For apps we went with our absolute favorite thing on the menu which is the Lobster Truffle Mac N Cheese, AMAZING! We love our mac n cheese and this is by far our favorite of any restaurant we have frequented. 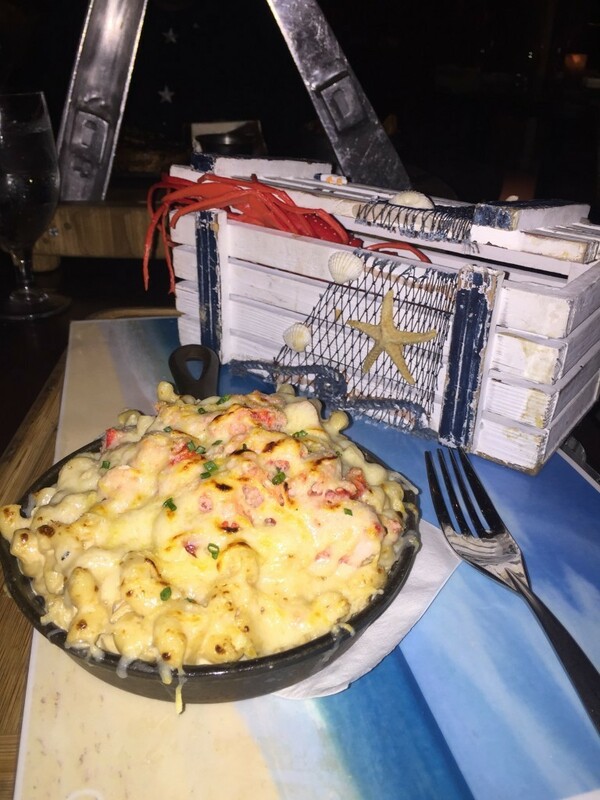 The presentation alone is noteworthy with the dish served on a heavy board with a lobster crawling out a crate that draws all eyes on your table. 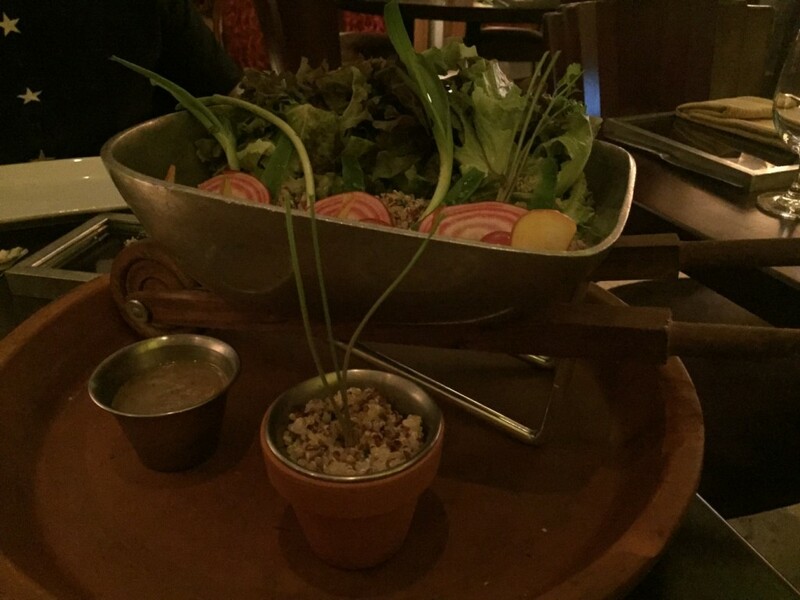 To accompany the lobster mac we ordered the Wheel barrow Salad (served in a wheel barrow), complete with onions, tomatoes, and quinoa. This light salad didn’t necessarily catch my eye when I looked at it on the menu but offered a very pleasant surprise. Very flavorful and actually makes you excited about the main course. Not filling at all and big enough for two people to share, I highly recommend this tasty salad as a starter. Main course time! We had a ton to choose from and this time wanted to try something different from our last visit. Skimming down the menu we ran into The Great American Steak! A choice of either the 14oz Ribeye cooked to your liking or the 8 oz Filet. You cant go wrong with either cut but me and my wife are huge Ribeye fans so it was an easy choice for us. 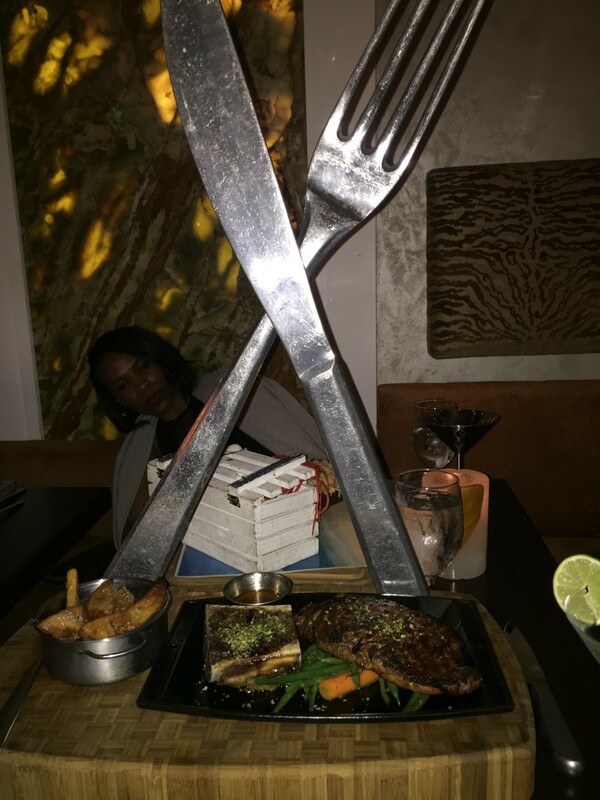 The entrée is accompanied with steak fries, maple glazed carrots and parsnips, and bone marrow, served on a gigantic wooden block and a huge fork and knife. Hardly room for dessert you think? WRONG! There is always room for dessert. But be careful, unless you have a big group, there is no way you will be able to finish dessert. All Barton G’s sweets are created to feed large parties, but if you think anything like me, you will take on that challenge. The desserts literally steal the show here, they are humungous portions of goodness and well worth the money you will pay. 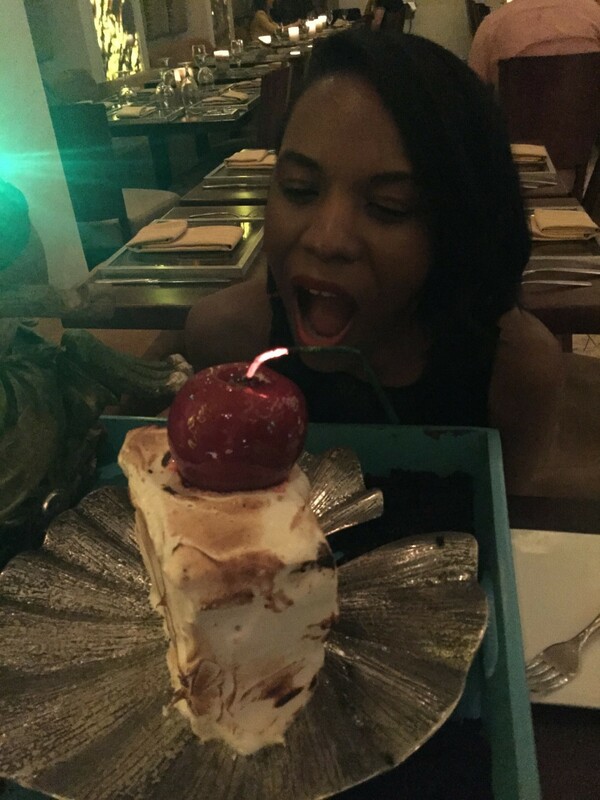 This is an amazing way to finish off this dining experience but be careful, you don’t want to have to be rolled out of the restaurant after inhaling the likes of the Treasure Chest Brownie. Me and the wife decided on the 7 layer Red Velvet Cake topped with a whole candy apple. This dessert comes with a little caution, but fret not your server has your back. This decident dessert is one of the biggest pieces of cake you will find, and in true Barton G fashion they set the cake on fire before you dig in. It adds a great element to the experience and really is picture worthy. It’s as good as advertised but we couldn’t finish 1 slice of the cake on our plates but I’m glad I got to taste it. All in all you can’t go wrong with Barton G and I highly recommend it to any and everyone looking for a great dining experience on their travels to Miami’s South Beach. Have you dined at Barton G yet? If so, tell us your experience below.